Whenever I hear people complain about US infrastructure problems, I shake my head. I always say that when you consider its vast scope and quality, the US driving experience has to be the best in the world, bar none. We take it for granted how good it is. As an example, main roads in Krakow, the Polish city where I live part of my year, often have long ruts from tires which I estimate can get 3-6 inches deep. They’re caused by hot weather, heavy use, and I’d guess low-quality asphalt. Gaping potholes are another standard feature in the automotive landscape. Interstate-style highways are practically nonexistent in the country. I don’t drive here (see previous 3 sentences) but I have ridden in vehicles enough to know that the driving experience is nowhere near what we enjoy in America. Poland has made leaps and bounds the past 2 decades, but road quality is not there yet. Even though we forget how good we’ve got it in the US, in such a car-focused culture, the road is still something like sacred space. The Amish intersect with mainstream society, sometimes loudly, on this space. Lately the big issue has been road safety and the buggy SMV triangle in Kentucky. But a second problem has been percolating in the Bluegrass State, having to do with another Amish vehicle–the tractor. The tractor is basically a mutant automobile. Four wheels, steering mechanism, self-propelled–just a funny-looking, slower version of the car, that you also happen to be able to do farm stuff with. Therefore many Amish permit the tractor, but restrict its use. They do this by requiring any tractors owned by church members to have steel wheels. Stripping them of their tires discourages Amish from taking their “farmer convertibles” out for a spin. 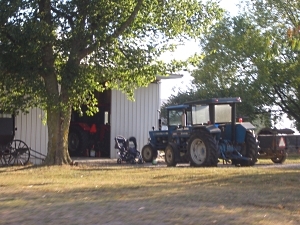 Amish churches also place regulations on where they can be operated, which means many Amish will use tractors to power equipment by the barn, but won’t use them for field work (horses instead). There are a few Amish communities where tractors are used liberally, including in Kentucky. Rubber tires are found on the tractors at the Guthrie KY Amish settlement. But most Amish with tractors are going to have the metal-wheeled kind. Steel-wheeled or not, at times the tractor also needs to be driven on the road. The metal clanking on the highway is loud and discourages driving at high speeds. But it also tears up the road surface, which is the problem one Kentucky legislator is trying to address (Update: article no longer online) via a proposed bill banning steel-wheeled farm implements. The metal wheels can leave ruts similar to the loud rumble strips designed to alert drivers on highways. Should Amish tractor drivers be required to pay for road damage, either via fines or a tax? There is such a thing as the HVUT (Heavy Vehicle Use Tax), for vehicles over 55,000 lbs. That starts at around $100, and maxes out at $550/year, based on weight. Roads are designed to handle rubber tires, but metal just isn’t a friendly material, especially rolling over hot asphalt. Would Amish tractor drivers object to kicking in a little bit, like semi operators do? Amish must have a lot of good sentiment among Kentucky legislators right now, because it apparently won’t matter, with the KY Senate Transportation Committee head reportedly not planning to call the bill to a vote. A similar case in Iowa ended up in the Iowa supreme court where the court overturned lower court rulings. “Cases involving religious rights present challenging issues. Here, a conflict has arisen between longstanding religious practice and a county’s legitimate desire to protect its investment in roads. On this record, we find religious rights prevail,” the ruling said. Of course the larger issue for these communities is how they get along with there neighbors over these issues and are they able-willing to pay for the damage caused by steel wheels. Florida will need to spend less then Pennsylvania for equivalent highways simply due two words: Snow and Frost. No plowing, no salt, no freeze/thaw cycles. The hot sun may break down asphalt quicker, but that’s a minor trade off for giving up winter’s assaults! A interesting report from CBS news on Americas roads! America’s Crumbling Roads and Bridges…………. Deliveryman Mike Sweeney used to just drive over the Lake Champlain Bridge to get to work. But it closed suddenly last fall with almost no warning. Now, Sweeney has to row to work. “Back in 2005, we also did a report card and it was still a “D” there, so we haven’t gained any ground,” said Andrew Herrmannwho helped write the report card. It examined every aspect the country’s infrastructure. Bridges got a “C” – but even with that average grade, 12 percent of the more than 72 thousand bridges are too old or what’s politely called structurally deficient. The problem with bridges became impossible to ignore in 2007, when the I-35 bridge collapsed in Minneapolis.Thirteen people died. Richard I have read about problems with bridges and of course there was the tragic incident in MN and yes sounds like the bridge department could use some work. We could probably add regional things like gridlock around cities, unpaved roads in sparsely populated rural areas, and deterioration on heavily-used roads that are just going to need constant upkeep by virtue of the number of cars traveling over them. But when you take in the vast area our road system in its entirety covers, including interstates and secondary highways, the system is really just impressive. I’ve driven all over the US and yes there are expected variations between states but for instance the interstate system alone is stunning when you stop and take a look at what it provides–the comfort, convenience and usability of traveling a system of wide roads with extensive facilities and amenities spanning a 3,000 mile wide country. I think GDP figures like the ones cited in that article you mention can be tricky b/c, for instance, what infrastructure baseline are you starting from, including area covered and quality of construction/type of road, not to mention what amount of money that actually represents (US economy still a lot bigger than India’s for instance). To be honest I think we are a bit spoiled when it comes to our roads and if we are not the best infrastructure in the world, which country is better? (I’m sure places like Germany have good systems but it’s a small system compared to the US). We have the largest road system by quite a lot, and rank near the top from what I can find in per-capita road statistics as well. And on that point, I also think comparing, say, paved road miles between countries can be misleading b/c roads can differ between countries. For example I would bet dollars to donuts the average American road/lane is wider than the average European one (take a look at car sizes and spatial considerations on the two continents–dense Europe, home of the “Smart” car, vs. spacious North America and its SUVs). I’m not trying to beat the American drum for the sake of beating it, I just think the bad press the US infrastructure has gotten can be misleading. I also just really appreciate what we have compared to what I’ve seen on offer elsewhere. I’d tend to agree with Erik. Our road system taken in it’s entirety is pretty darn impressive. Groups like the Civil Engineers & construction industry have a deeply vested interest in encouraging spending on infrastructure and will lobby that the glass is half-empty and leaking. That said, I do support raising gas taxes (and changing them from a fixed cents per gallon to a percentage system like sales taxes) to invest in further maintenance and improvements because we can make things better. There are problems, its just I suspect it’s often overstated. And many of these improvements aren’t huge projects like new roads. Many, many interstate interchanges handle far more traffic then their “geometry” is designed for. Lengthening approaches and merging lanes, less sharp curves on ramps, etc would all help the flow of traffic. I *might* not live to see it; my friends’ kids however will — that one day our limited access highways will require automated cars. Nevada just started issuing licenses & plates for driverless cars. Having the cars control speed and following distance will dramatically increase highway capacity within the same footprint. Matt the driverless cars is an incredible development on the horizon and one I’m still trying to wrap my head around. I think Google is pioneering this? It makes me wonder which will be the greater popular “acceptance barrier” to leap, that from carriages to cars, or from cars to driverless cars? I’m sort of skeptical that this will work though–a case of something that we CAN do, but that the public just doesn’t accept? I haven’t read much on this but I am assuming they are designing these to have a quick manual takeover possibility. Most roads in Canada are actually pretty good. I mean there are places where roads are non-existent between communities (some places along James Bay and Hudson’s Bay in Northern Ontario and Quebec, for instance, or the “High Arctic” in the there territories have no road connections to other communities or the outside world, and you have to rely on planes and in some locations, depending on the southerliness, trains), as well some places still have gravel roads for reasonably short distances, and then there are farm paths off roads that farmers create by sheer use, but the last aren’t official roads. Even in my community people say we have crummy roads, but seriously though, at least people here are not driving along and not paying attention and then accidentally falling completely into a gaping large hole, not to my recollection anyway. While the Trans-Canada and roads in well-funded provinces are generally good, here in New Brunswick we have terible secondary and tertiary roads. We had a pothole in our old neighburhood that we named it the “Shawn Grahem Memorial Pothole” after the then-premier, who promised to improve the transportation infrastructure. One year, roads in three adjoining parishes washed out, were covered with rockslides, or under water. Here in the Finger Lakes region of central-western New York we have many Mennonites and some Amish who have steel wheeled tractors. My husband always points out the road damage when we drive by their farms. They really do tear up the road. That’s not really good for all the rest of us using the road. Many states that experience snow fall also have seasonal restrictions on just how long one can keep studded snow tires on a car. Around southern New England, studded snow tires are more a less a thing of the past, but in some, more mountainous areas, such as where my brother and his family live, in Bend, Oregon, I understand that studded snows still get some serious use. I learned this when I commented to my brother on the rough, grooves cut in some of the state highways around Bend and Sisters, OR. They weren’t inches deep such as what it sounds like exists in Poland, but they were noticeable just the same when changing lanes at 50 to 60 mph in my brother’s county. I stand largely for religious freedom, but expecting fellow county-folk to shoulder serious road damage to allow such freedom is a bit much. The Polish roads I was talking about get like a wavy effect, from what I can tell it’s from the weight of the cars tires simply pressing into the asphalt–worst-seen near intersections where cars are waiting at lights. When you cross the road as a pedestrian you easily trip on the grooves. I noticed they fixed one of the worst ones a while back, but not sure what it looks like now. I used to follow a “Road Geek” group…what you describe is called rutting, just like you get ruts in a dirt road! Poor paving — both the underlying gravel and the asphalt on top — is part of the problem. You see it especially at intersections because the cars transfer their weight to the front wheels when you hit the brakes…this puts extra downward force pushing on the asphalt. You’ll sometimes see this on curves as well, where cars are trying to push outwards. The “fix” is for busy intersections, in otherwise asphalt paved roads, to be made with concrete. The intersection I was talking about got re-asphalted, not concrete-d, unfortunately. Would it make a difference if the steel-wheeled tractors were driven on the road only when the pavement is not hot? Like before 10 a.m., or when the air temperature is less than 70 degrees? Steel wheels are inappropriate on paved (or gravel!) roads at any time. Gravel is just cheaper to repair with a grader afterwards. Amish west and south of Middlebury, In. (Clinton Districts)use tractors with air or foam filled tires for everything but plow, plant and harvest. Skid loaders are even used to load manure into the manure speader. They even pick corn with a two row picker into a gravity wagon which is then pulled to the corn crib by a tractor. I doubt it would be practical to refrain from using steel wheels during hot weather—the crops still need to be tended, and I’d guess that it can still be pretty warm during harvest time (depending on the crop, of course). Loved your comment title Alice Mary. …not fair to ruin the roads for everyone who must use them. Of course, I don’t doubt that these “do-it-yourself” rumble strips cause would-be speeders to slow down a bit, and that can be a GOOD thing in Amish country, what with so many car-buggy accidents. I started to think about when I was a child/young adult and every autumn/late summer the roads in Sweden started to fill up with Polish cars driven by people who came here to pick berries and sell them to earn an extra buck. You don’t see that many today, I assume there is not enough money in it now. I kind of miss them seeing them, and I always pictured it as a good way to make some money and still get a vacation for the same price. Berry picking was pretty big for awhile Elin, but I haven’t heard a lot about it lately. Might just reflect improvements in the Polish economy or perhaps there’s a better work alternative out there (or maybe I’m just not talking to the right people). Poles don’t move around as much internally as Americans but they do seem to emigrate for work, ie Chicago and more recently the UK/Ireland in large numbers. No, I would also assume that the improvements in the economy ‘killed’ berry picking for Polish people, nowadays it is mainly people from Thailand or so that does it. There have been many scandals because companies have tricked people which I think there was much less of when it used to be people from Europe who came here. They often had their own cars and were not dependant on someone paying for their flight or so. Oh, yes, when I was in Dublin every other person was from Poland it seemed. I was asked several times if I was Polish myself. I have the problem of not looking like the stereotypical Swede being short, dark-haired and not very slender so people never guess the right country for me. Germany, Poland and Finland are popular choices… Some people seem to believe that there are no dark-haired people at all here in Sweden, or if there are that they are recent immigrants or so. Some of the heavily-traveled roads in PA and Indiana Amish Country have a wide shoulder lane for the slower buggies. Is there enough land or room to make a special lane beside the main road for tractors in Kentucky and Iowa? That sounds like a smart idea, Lin. If we (in cities/suburbs) can have bicycle lanes (or other “specialized” lanes for traffic of one kind or another), it would make sense in a more rural area (or where horse & buggies are common) to be “accommodating” and add that special lane. It would be a benefit to non-Amish, too. I’m guessing it would require widening the roads which could be a problem if there are utilities/sewers involved, AND it would probably involve buying up land from multiple owners (or using “public domain” rights, etc.) to acquire the space in the first place. (…always something!). Folks who haven’t seen them should search for “steel tractor wheels” on images.google.com to see what these beasts look like! Many antique tractor collectors bolt thick pieces of rubber in the “valleys” so they can be driven in parades w/o tearing up pavement. This, however, impairs performance in fields. If the tractors were just crossing highways, you could lay boards down to prevent damage. That is not practical going distance down the road! Unlike the SMVs that I think you can make a reasonable compromise — requiring subdued reflective striping — I don’t know how you allow these wheels on pavement. Maybe on gravel roads you could propose a modest fee to pay for extra grading (which could even be paid off by in-kind services doing your own grading). Pavement? Far too costly to repair to ask the tractor users to pay to repair. Another option, which could be costly initially, would be a separate lane for animal drawn and steel wheel vehicles made with a crushed stone surface that could be easily graded. Require crossing of asphalt to be made on planks. I think the steel wheeled tractor debate is biggest among the Mennonites. My husband’s family belongs to this sect. They drive their horse and buggys on the road, but are allowed to have tractors for farming purposes. The steel wheels were required by the church to prevent the farmer from making a ‘comfy’ trip to town with his tractor instead of hitching up the horse. The problem is that now many farmers are produce farmers and often make several trips a week during peak season to the produce auction. This might be 10 miles away. They use their tractors to pull the wagons laden with produce. So the farmer WILL be going on the road, the steel wheels are not preventing that anymore. You ask most any steel wheeled tractor driver if he thinks a rubber wheeled tractor driver will go to hell and he’ll probably admit that no, he wouldn’t just based on that. This is something that the Mennonites/Amish could change with little to no spiritual consequences. If these groups keep crying ‘religious freedom’ over frankly stupid issues, like the steel wheels and SMV triangles, when the real test comes along nobody is gonna care anymore. It’s the little boy crying wolf all over again. Kentucky Amish Near SMV Freedom?